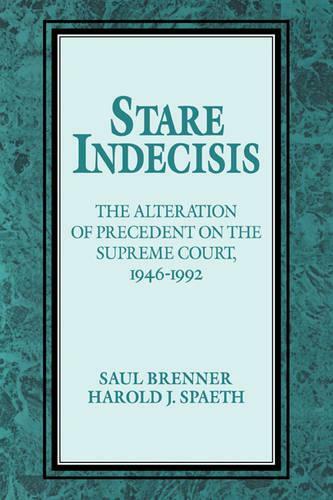 The concept of precedent is basic to the operation of the legal system, and this book is a full-length empirical study of why US Supreme Court justices have chosen to alter precedent. It attempts to analyse those decisions of the Vison, Warren and Burger Courts, as well as the first six terms of the Rehnquist Court - a span of 47 years (1946-1992) - that formally altered precedent. The authors summarize previous studies of precedent and the Court, assess the conference voting of justices and compile a list of overruling and overruled cases. Additionally the authors draw a distinction between personal and institutional stare decisis. By using the attitudinal model of Supreme Court decision-making, which is normally seen as antithetical to the legal mode of voting, the authors find that it is the individual justices' ideologies which explain their voting behavior.